After the Tannenberg campaign of August-September 1914, East Prussia became a strategic backwater as both sides focused their efforts in Poland. But the Russian threat remained, and the following winter the Germans set about cleaning up their northern flank. 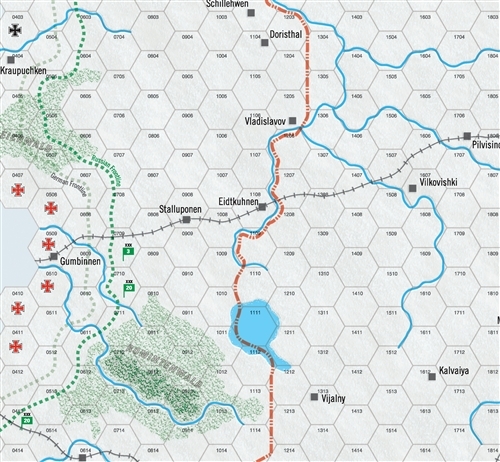 A massive attack on the open right flank of the Russian Tenth Army sent it reeling; only the sacrifice of an entire corps in the Augustowo Forest enabled it to escape. 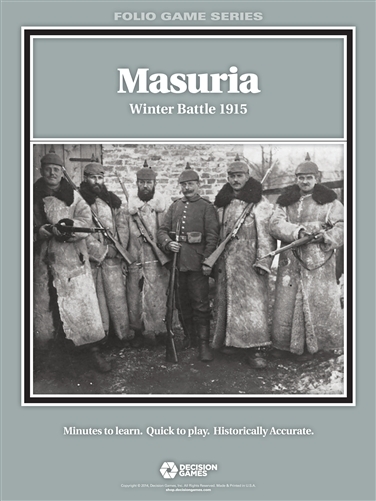 Masuria uses a modification of the Fire & Movement game system. Developed to portray the mechanized battlefields of a later generation, F&M stresses the use of rapidly-concentrated fire support to generate breakthroughs, followed by a rapid penetration by mobile reserves. In 1915, although railroads allowed the rapid shifting of forces on a large scale, no one moved faster than a man on foot on the battlefield, making exploitation ineffective. However, here both players have hidden movement, allowing them to concentrate in unexpected locations to surround and destroy isolated enemy units. The clumsy and inflexible fire support is represented by the artillery brigades available to division and corps commanders. It must be brought to the point of decision, then supplied to give it the firepower to affect the fighting. 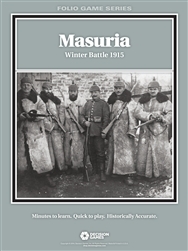 The historical outcome at Masuria was the clearing of the East Prussian border. It might have gone differently; Russian reserves were available, and the German forces were a hodge-podge of units of widely varying quality. Both sides have a number of options to turn the fortunes of the campaign. The player who makes the better choices, and backs his strategy to the hilt, will emerge the victor.